When raising chickens "on pasture," where they graze on fresh grass, there is a distinct advantage to having a portable coop that can be moved around your property to keep the chickens enjoying fresh pasture. The coop constructed in the example below is based on plans from Harvey and Ellen Ussery, proprietors of The Modern Homestead. The steps shown below are an overview of the clear and detailed instructions offered by Harvey and Ellen, which are suitable for even the most novice DIYers. The Ussery system for managing laying hens on pasture uses a large, portable chicken coop and electric net fencing to create a yard area around the coop. The hens, coop, and fencing are moved to fresh ground every week or two, or as needed to keep them grazing on fresh grass. Here are the general steps depicting the crucial elements of building a moveable chicken coop. This broad description will make it possible for you to design and build your own for the needs of your small farm or homestead. We used 2 x 4 lumber for the bottom frame of this coop, with metal corner braces and screws used to secure the frame pieces together at the joints. Choose a size for the bottom frame that creates a good footprint size for the coop. If you'll be using your coop with a surrounding fence, plan on a minimum of three square feet of floor space per bird. The movable coop shown here is 9 x 8 feet, or 72 square foot— a good size for about 24 chickens. It is essential that the bottom of the frame be perfectly square. You can use a carpenter's square to ensure the squareness of the frame. Or, you can check for square by taking the diagonal measurements from opposite corners of the frame. If both diagonal measurements are equal, the frame is square. The portable coop being built here is an A-frame design. Use a table saw to rip 2 x 4 lumber into thinner pieces for the diagonal rafters and the top ridge board of the coop. A power miter saw is helpful for cutting proper angles on the ends of the rafters. Assemble the pieces together with deck screws. In traditional construction, spacing between rafters is 16 inches apart, although 12- or 24-inch spacing is also possible. Two additional bottom stringers are installed with deck screws to provide greater stability to the bottom frame. As you'll see in later photos, we also added collar ties across our A-frame rafters to tie them together to add stability. Then we built the end framing—three vertical studs that form a frame for a door at each end of the coop. Our design uses additional long stringers attached about 2 feet directly above the floor stringers to serve as roost bars for the birds. A vertical support post supports each roost bar in the center. Laying hens usually prefer to roost if given the option, but these roost bars won't be necessary for meat birds or broilers, which typically don't roost. Pullets and cockerels begin roosting at about three to four months of age. In this design, the collar ties between rafters also serve as high roosts. For high roosts, make sure hens have a way to get up to them. In this design, birds can reach the high roosts by hopping from the lower roosts. Roosts can be made out of recycled and repurposed materials. Twigs and branches work especially well, as do old ladders. For portable chicken coops, though, make sure that the roosts are fastened to the frame securely. If you keep laying hens, you'll need nest boxes where the birds can lay eggs. These can be very simple boxes lined with a metal hardware cloth on the bottom and attached to the frame of the coop. The sizes of the boxes will vary depending on the available space. Build a simple box out of 2 x 2 boards, securing the joints with deck screws. Add a 2 x 2-floor "joist" across the middle of the box for stability, again attaching it with deck screws. Staple metal hardware cloth across the bottom of the box frame. Add 4- to 6-inch high sides of plywood to the boxes, using deck screws. Position the boxes in the desired locations, securing them to the roost bars and collar ties with deck screws. If you want to use recycled materials, next boxes might be constructed from plastic tubs or old wooden crates attached to the coop frame with screws. Aim for one nest box, or one square foot of community nest space, for every 4 or 5 hens. Nest boxes should be at least two feet off the ground. They will be lined with straw. Although the ends of the coop can be left open entirely, we covered the portions adjacent to the nest boxes with 1/2-inch plywood to protect them. We also constructed swinging door panels attached with hinges, which allows for easy access for gathering eggs and cleaning the nest boxes. It's possible to cover over most of the end area of the coop with plywood or scrap wood, but remember that full enclosure will mean less ventilation. In an A-frame design like this one, all air circulation will come from cross ventilation through the ends of the coop. It's a good idea to leave enough open space on the ends of the coop to allow for air to flow. Normally, it's best if your coop has end doors that you can close at night, and so that you can confine the chickens inside when you move the coop. 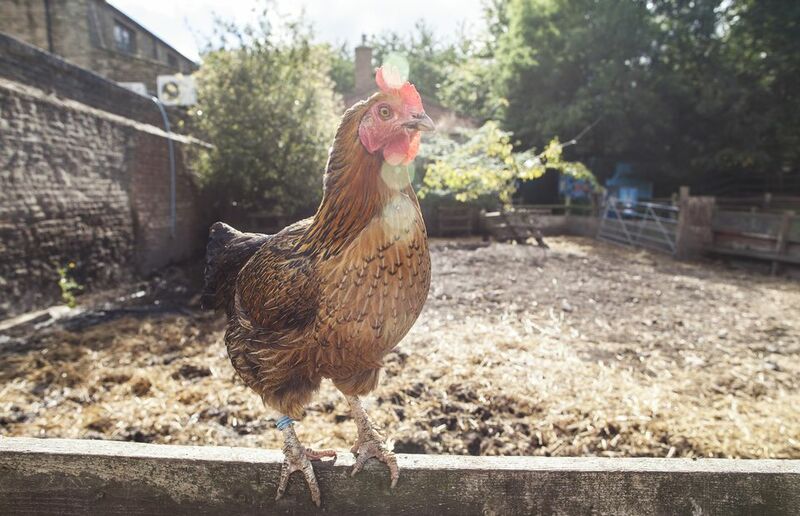 It's also a good idea to be able to shut the hens in for the selection of specific chickens for culling or other purposes (such as isolating a sick hen). Our doors are made from a simple 2 x 2 frame with a diagonal cross brace, which is then covered with chicken wire. We used flat metal braces to reinforce the corners of the frame. If you wish, the door can be secured to the end studs with hinges mounted on one side of the door. Or, if the will only be used sporadically, the door can be screwed in place when needed. The remaining triangular spaces above and to the sides of the door are also covered with chicken wire. Roofing can be of many materials, and certainly scavenged and repurposed roofing of any sort can work. In our example, we used painted galvanized steel roofing. Other possible materials you could use include greenhouse plastic or even a tarp. Metal panels are cut to fit and secured to the rafters with screws. A V-shaped metal ridge cap at the top will seal the top against water. Apply caulk to the seams from the inside to make sure the coop is watertight. In our example, we allowed the roof to slightly overhang at the ends of the coop, to provide additional rain protection. Wheels are a key part of any movable chicken coop unless the coop is so small that it can be dragged along the ground or lifted and carried. Make sure your wheel is large enough to ensure good clearance on your terrain—use bigger wheels for bumpy, uneven ground, and smaller ones for level, short-cut grass. Wheels that are too big will allow birds to slip out from under the bottom frame as you move. Wheels can be installed by drilling and inserting carriage bolts through the bottom frame of the coop at all four corners, then using these bolts as axles to hold utility wheels in place. When you move your hens across the pasture, go slowly and watch for any chickens getting caught under the back of the frame. If you move slowly enough, the birds should get the idea and move along with the coop.